Sometimes things like a garage door seem to be taken for granted, but once there is a problem that cause it to malfunction, you realize how important it is and how disruptive it can be to your daily routine. Living in the Little Elm, TX area, you must be aware of that, and it is time for you to know about a repair service that could take care of all of your garage door needs. Veteran Garage Door Repair Service provides the best solutions in the Little Elm area. There is absolutely no problem that the company’s amazing team isn’t able to solve, as quick as possible. Time these days is a very important matter, and we take it into consideration when you decide to pick up your phone and call us for our services. 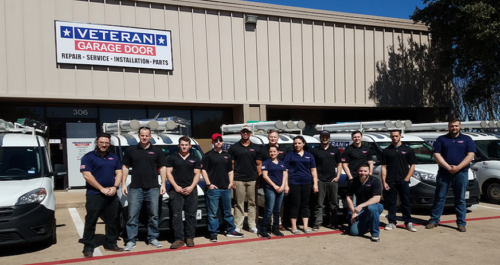 Veteran provides same day service, and our friendly, highly professional teams are spread across the area with fully equipped service vehicles, for every problem that may occur with your garage door. Our employees are at the top of their game and they are very skilled, plus the fact that they will be more than happy to aid you in your time of need. Garage door repair in Little Elm has never been more accessible. Veteran Garage Door’s services cover all known garage door problems, among them you can find: broken hinges, loose chain belts, sensor issues, broken rollers, garage door cables, openers, bent sections, broken springs, bent tracks, door off track, gear sprockets, capacitors and much more. We also install smartphone-controlled garage door systems that allow you to easily control your garage door’s activity. In addition to fixing your garage door, Veteran can also supply you with an entirely brand-new garage door. The company has a few collections for you to choose from, made from different materials and in different price ranges. You are more than welcome to contact Veteran Garage door today, for all of your needs pertaining to garage door repair in Little Elm.